Ghost Fleet: The government needs to work with Silicon Valley to create our military future. The government needs to work with Silicon Valley to create our military future. 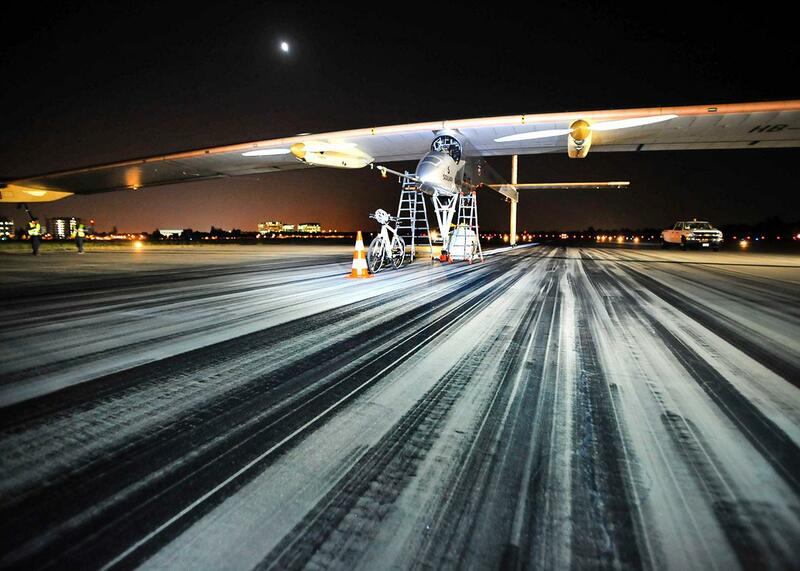 The Solar Impulse plane sits on the tarmac at Moffett Field in Mountain View, California, on May 3, 2013. In 1931, the city fathers of Sunnyvale, California, came up with a unique plan to rescue their town from the doldrums of the Great Depression. They raised $480,000 to buy nearly 1,000 acres of farmland and then sold off the land to the U.S. government for $1. The deal was that Sunnyvale would then become the home for a new planned Navy fleet of “flying aircraft carriers,” massive helium-filled airships that would serve as bases in the air for propeller biplanes. The plan didn’t work out as anticipated, neither for Sunnyvale nor the airships. * In 1933, the USS Akron, the Navy’s test airborne aircraft carrier, crashed. The plan was shelved, its only legacy that the airfield was renamed after Adm. William Moffett, the head of the Navy’s Aeronautics Bureau, who had been killed in the crash. But, fortunately for the town, World War II interceded a few years later, and Moffett Field became a base for patrol airplanes and then the home of the U.S. Air Force Satellite Test Center. By the 1950s, several big aerospace firms clustered around the base and the test center. The thousands of scientists and engineers who moved into the sunny valley built close ties with local universities, and the old farmland became the hub of a different industry. The city fathers’ plan of economic growth through blimp basing instead spawned what became known as Silicon Valley. Those paragraphs come from our new book Ghost Fleet. The little-known history is instructive, as today it is the U.S. military that is looking to Silicon Valley for help. Faced with disruptive technologies like robotics and 3-D printing and a new strategic competitor in China that many worry could some day risk outright war, the Defense Department has kicked off an effort to “woo Silicon Valley.” Like any good military plan, it is multifaceted. It kicked off with the first visit to Silicon Valley by a serving secretary of defense in nearly two decades. (That the Pentagon’s civilian leader had not been to such a central locale of American innovation and competitiveness is not just illustrative of the distance between the two regions, but an indictment of past leaders.) Secretary Ash Carter spoke of needing to develop a “coolness factor” around the Pentagon’s pursuit of the latest technology. He also announced the creation of the Defense Innovation Unit–Experimental, a small Pentagon outpost to be located (not so ironically) at a building near Moffett Field’s massive airship hanger, which is now leased by Google. It all sounds good, but if this effort is going to succeed, though, the military will first have to navigate a few challenges. The biggest perhaps may be the clash of the D.C. Beltway and Silicon Valley cultures—the differing realms idealized by government bureaucrats and tech geek billionaires. Some argue this isn’t a problem because of the long-standing ties between the two. From GPS to driverless cars to software algorithms powering search engines, federal funding through Pentagon programs like DARPA has helped seed many of the game-changing technologies Silicon Valley firms are now building for the civilian economy. That was the message from Carter earlier this year, when he spoke at Stanford University about the need for even closer ties between the government and the tech sector. “The government helped ignite the spark, but this was the place that nurtured the flame that created incredible applications,” he said. The challenge in the post-Snowden era, however, is that the level of distrust toward the Beltway remains high. Silicon Valley has received a one-two punch. It is smarting from revelations of NSA surveillance, with estimates of tens of billions of dollars in lost revenue from ensuing foreign backlash and lost contracts, most notably in cloud computing. Then a new government campaign calling for encryption backdoors comes across to most techies and many defense experts as tone deaf. But the schisms go deeper than today’s debates. The culture of the tech sector is experimental, and winning investors place big bets across a wide portfolio seeking out the winners that will be most disruptive. The Pentagon, Congress, and traditional defense industry certainly want the newness aspect of disruptive technology but struggle with a corollary: The outdated must be discarded. There is a long record of DARPA and other parts of the government funding exciting new project that then wither away in that space between lab and program of record because they can’t supplant whatever old gear is in the way. Indeed, there is even a term for it: the valley of death. For instance, DARPA has turned to innovators to design a new, agile tank of the future known as the Ground X-Vehicle Technology. But for the GXV-T to succeed, the M-1 tank will have to be displaced, which is a problem. Even though Army analysts have said since 2012 they don’t need any more M-1 tanks, the factory keeps getting hundreds of millions of dollars in contracts. Surely it’s a coincidence that the factory is located in the election battleground state of Ohio and owned by a major defense contractor that spends more than $10 million a year in lobbying. Part of the problem is that the technology sector can be ruthless in a way a political organization can’t. Companies can be both created and closed in a way that government bureaucracies, and even the businesses they support, can only imagine. Compare Google’s corporate culture, built around empowering young talent and disruption, with the Pentagon’s organization and personnel system, which has remained the same for literally decades. A recent expose of Amazon’s amazing but almost surreal efficiency stunned many readers. But no branch of the U.S. military has passed a single audit to even balance their books in the two decades since they have been required to by law. The business cycle in the Valley ecosystem rewards the speedy and agile, while most Pentagon programming is anything but. For instance, Google’s robotics program has rapidly proliferated projects include self-driving cars, drones, and humanoid robots already able to run through forests (albeit while plugged in). Meanwhile, the military’s internal project to build a single ground robot is now seven years behind schedule and the technology is behind what the market already provides. Notably, several of the Google robot projects originally received DARPA funding, but they advanced much more once they left the government auspices. As thorny as these factors seem, however, there may be an underlying problem that people aren’t as willing to talk about: Is Silicon Valley even “American” in the way the Pentagon would like to think it? This globalization is why such firms have thrived, but it also poses different questions for their CEOs and boards of directors when the U.S. government makes requests relating to national security. Do multinational firms go with where their founders are from, where their corporate headquarters are physically located, by where their business takes place (often in the non sovereign spaces of the Internet), or where their shareholders live? The Snowden affair pulled this curtain back when many firms actively resisted being viewed as American entities in a bid to keep from losing international customers. Indeed, as the Pentagon tries to cozy up to do more business with tech, many of the global giants are choosing to stay away. Google, for example, has bought 12 firms in the important emerging military field of robotics, but then steered them out of military contracts. There are no easy answers to these challenges. The best that can be done is to treat the effort as a long-term campaign to build enduring relationships. In this effort, the Pentagon has to understand that its outreach won’t easily be adapted nor reciprocated. It has to demonstrate a willingness to implement the buzzwords it is starting to use and to put forth a value proposition that both parties receive by working together. It also needs to demonstrate that it will take seriously the dilemmas that multinational companies will face in wartime. Today’s peacetime partnerships need to be solid enough that the people driving the tight innovation cycles, high failure tolerance, and speed to market feel a sense of partnership toward government, not dismay and distrust. There may be no more important venture for the U.S. military and its ability to win the big wars that we all hope never come than its outreach to the civilian tech sector and innovation hubs like Silicon Valley. The most important element for the U.S. and its allies, whether it’s facing ISIS or China, is less the ability to buy or own any one technology than it is to cultivate and develop the communities of people who are doing this at scale and in some of the most competitive commercial sectors of the global economy. It’s promising that Defense Secretary Carter is scheduled to return to Silicon Valley this week to visit the Pentagon’s new office and speak with business leaders, according to Defense One. To woo Silicon Valley will require a long-term campaign to build and maintain relationships. In this effort it is important to remember that coolness and buzz help get attention but it takes more than that to build an enduring and successful business, let alone prevail in 21st-century warfare.